Experience The Joy of Family Music®! For Children Ages 0 to 4 with a Parent or Caregiver. Class length 45 minutes. Young children learn best by watching others and by playing and experimenting. Just imagine how much they could learn in a music class where children from birth to age 4 are all participating at their own levels—singing, moving, listening, observing, and exploring musical instruments in a welcoming and supportive environment. 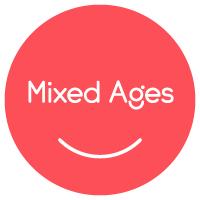 Our Mixed-age Class is perfect for you and your little one! In each of our classes families also receive take home materials (CD, Songbook and Parent/Caregivers Guide), and access to the online Family Music Zone filled with activities to continue the music making at home. Siblings of registered students who are 10 months and younger by the class start date attend for free, however we ask that you please register them also.